Our Schuco ASS70 FD bifolds transformed this Surrey home. Like many of our other Schuco customers, this homeowner chose a set of our 2 pane Schuco ASS70 FD bifolding doors for their property. Schuco ASS70 FD bifolds have been and continue one of our most popular products. Throughout 2014, 2015 and now at time of writing in early 2016, we install around ten Schuco ASS70 FD bifolding doors every month, and it doesn’t show any sign of slowing down. Schuco is fast becoming a name and brand that homeowners recognise. Through the contact form on the Schuco website, homeowners can input their details and be put in contact with reputable fabricators and installers local to them. Many of the enquiries for our Schuco ASS70 FD bifolds come through this way. 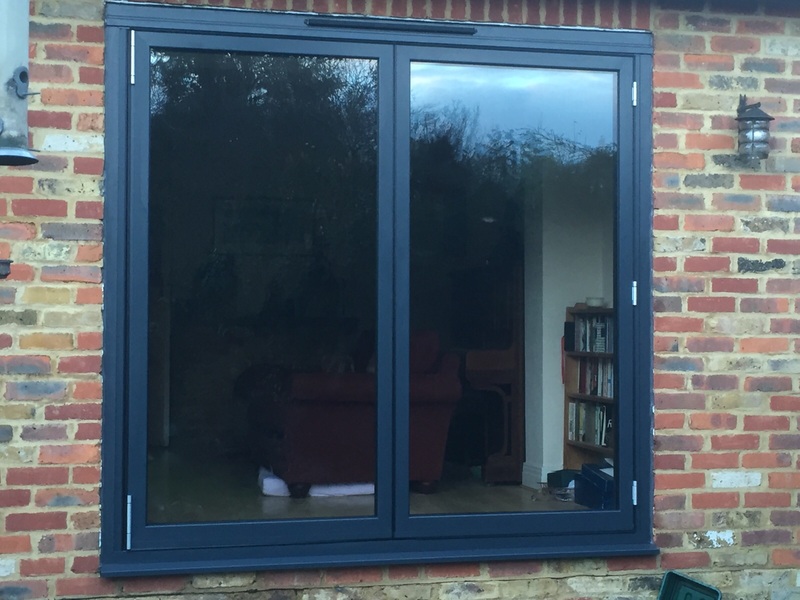 They are often put in touch with 5-10 fabricators and installers and the sales and project management service we provide either in the home or at our Kent showroom often means customers choose us. They find that being able to visit our showroom allows them to see and use the products they are going to purchase fills them with confidence. Moreover, they get to know our friendly team, which is also an important factor in any purchasing decision in any industry. This customer was no different. Having seen and been impressed with the German engineering of the Schuco door system, she arrived to us through the Schuco website and James handled her enquiry. As this customer was able to provide us with sizes and a photo of the existing doors, we were able to quote without actually visiting the site. This suits many of our customers who, with their busy lives, want quotes quickly! The size of the aperture made it perfect for a 2 pane arrangement. This does mean there can be no “traffic” door, which is essentially a single door on the end that can be opened independently from the others. This also means that there can be no handles or locking outside. Many customers actually like this as it makes them look very sleek from outside. Trickle vented for better ventilation. Agreeing to our fair price within a couple of days, we got the order processed and onto our systems. Our surveyor Terry attended site and took final measurements. The metal was ordered just before Christmas, and given the 2 week Christmas/New Year closing down, we installed everything at the end of January. The installation took the best part of a day as our team carefully removed the old doors and installed the lovely new Schuco ASS70 FD bifolds. Before and After below photos below. You can also head over to our bi-folding doors gallery here for further inspiration.